I rarely have my own creations in stock, but if you see any here, they are available for immediate delivery. All others are original period wheels. 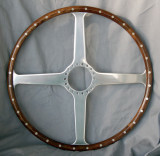 Derrington for Jaguar MK 2 - Original 17"
NOS Les Leston for MINI Complete with Boss - 13.5"
Hey Mike, I´m from Portugal and i wanna know if do you have the hub boss to les leston 13,5" - NOS Les Leston Wood Rimmed Steering Wheel for MINI? This model is the same of that NOS Les Leston for MINI Complete with Boss - 13.5" (now sold)? hey Mike, these steering wheel are for sale? 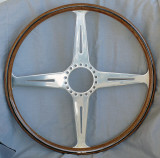 I am interested in the Lamborghini Miura wheel, looks like it's in great condition. Can you provide details, price, shipping details etc? 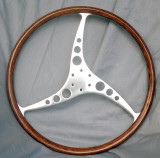 I would like to explore a steering wheel for my 1977 Mercedes-Benz 450SL. 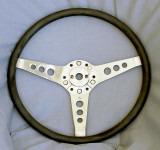 The stock steering wheel is 420mm. I would like to have a wheel no greater than 420mm and less than 390mm. 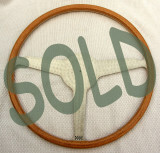 (1) Which steering wheels meet this requirement along with there associated price? (2) Are the corresponding horn assembly and hub/boss available also? Jean: I will need an email address in order to respond. 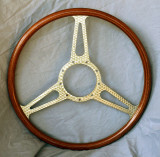 I'm looking for an original aston Martin DBS 1968 wooden 15" dished steering wheel, would you by chance have one of these? Hello , I have a Les Leston signed stirling moss steering wheel. I was Interested to see you had one in your gallery. Can you tell me anything about these steering wheels. A car I bought already had one fitted. I would love to know when they first became available and any other Information that may be known. I have to say I love the sensitive comfortable touch these slim wheels provide, I think they have more to offer than just good looks. Regards Murdo. 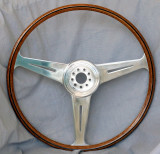 I'm looking for Sunbeam Alpine a wooden steering wheel, have you one ? Does the Derrington double walnut in stock adapt to a 1977 MGB? What is the price, including shipping to Canada? 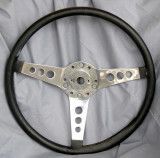 Hi Mike, I am looking for Original Sunbeam Alpine MK V steering wheel. Would you be looking at doing a batch of replica Mota-Lita 15" wheels similar to what's found on a 65 GT350 Shelby? 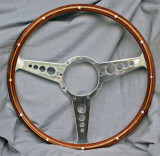 Mike, Do you have a woodrim wheel & adapter that will fit a '67 Healey 3000? If so price please. Regards, IAN GAIL. Supplementary to the question I posted a few minutes ago: What wood is that on the TR4 wheel? The dash on my 250 is African Rosewood and I'd like them to be compatible. 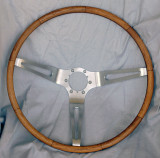 We spoke 2 weeks ago about the 14.5 Les Leston down slant teak wheel. Is this wheel available? If so please let me know the price and if it will fit a beck speedster replica with a 924 spline and a 6 bolt hub.